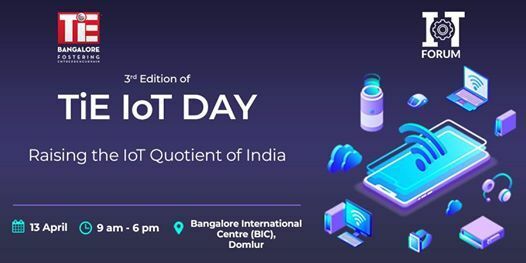 Join us for the third edition of TiE IoT Day - a day-long event to set the context to developments in the rapidly-changing world of IoT, celebrating International IoT Day and the burgeoning IoT startup ecosystem in India. The scale of opportunity to solve massive problems with IoT intervention in India is unprecedented! 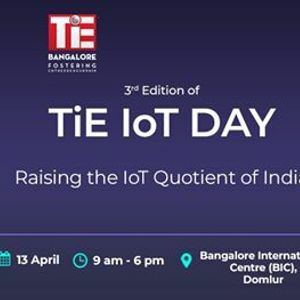 TiE IoT Day is a Thought Leadership Conference bringing together leading thinkers, experts, agenda-setters and practitioners from across the IoT ecosystem to educate, mentor, debate, discuss, connect and ultimately inspire solutions for solving large problems using IoT as a base for the country. Get inspired. Innovate. Network. Learn from people who have been where you are and pushed beyond. Register now to avail the early-bird offer!